CrystalDiskInfo iss a portable tool that gives you a complete readout of all your computer's SMART information, as well as a current temperature and health status. From its dashboard, you can quickly see a long list of up-to-date system data, so you know when things are going well, and if it seems like something is going wrong. This program provides a clear interface that makes it easy to find what you're looking for. The computer's Temperature and general Health Status are displayed prominently at the top, and the lower part of the interface includes a list. No installation Is required to use this tool. CrystalDiskInfo is a handy monitoring tool that displays information about hard drives, whether it is a HDD, a SSD or even external disks. The interface is well organized and comprises detailed hardware specifications: the drive model name, the number of partitions and their letters, disk size, firmware, serial number, interface type, transfer mode. As well as a number of functioning parameters, such as the buffer size, the NV cache size, the rotation rate or the power on count and on hours. 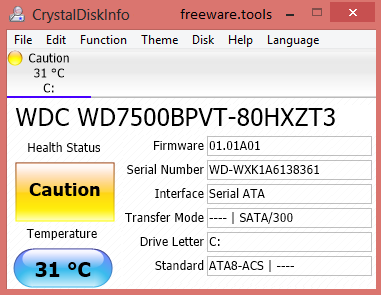 In addition, Portable CrystalDiskInfo monitors the disk health status and its running temperature. It also reads the S.M.A.R.T. attributes, which can help you anticipate hard drive failures and thus prevent data loss. You can view the current, the worst, the threshold and the raw values for the read error rate, the spin-up time, the seek error rate, the spin retry count and more. The software can generate graphs for any of the indicators, where you can view their evolution and compare hard disk parameters using visual representations. Furthermore, if any of the indicators overpasses the set limits, the application can notify you via email or by playing a user-defined sound. All the displayed information can be easily sent to your clipboard, enabling you to save it to a text file for later reference. The application also comes with advanced features, such as AAM / APM control and auto adaption, disk search options, Intel RAID and USB support. You can use the 'Disk Management' tool to manage disk partitions, shrink or remove volumes, create VHD files or change drive letter and paths. Portable CrystalDiskInfo is a useful tool for any computer user, as it enables you to keep a close eye on the functioning parameters of your hard disks, in order to avoid losing data and system crashes. Furthermore, it does not require installation, so you can run it from any removable drive, without worrying that it might affect your registry.